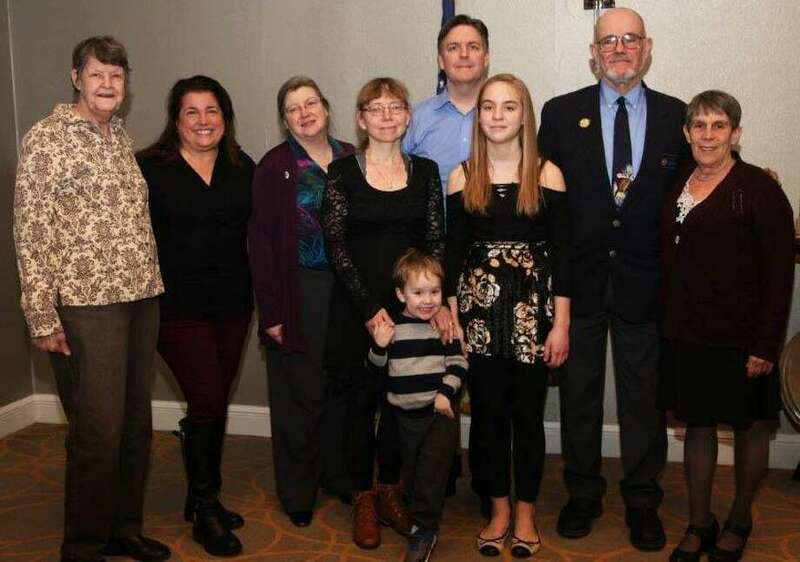 Schaghticoke Middle School eighth-grade student Kathryn McDonagh has been named a winner in the New Milford VFW Post 1672 and its auxiliary’s Patriot Pen Essay Competition. Above, from left to right, are Auxiliary Scholarship Chairman Pat Brought, Kathryn’s teacher Keli Solomon, Post 1672 VFW Auxiliary President Marcella Martin, Kathryn’s mother and father, Luiza and Matt, Kathryn’s brother, Max, Kathryn, VFW Department Commander and President James Delancy and Laurie Allen. The New Milford VFW Post 1672 and its auxiliary has announced the winners of the Patriot Pen Essay Competition. Schaghticoke student Kathryn McDonagh’s entry, “Why I Honor the American Flag,” was selected for a $100 award from among 26 entries submitted by Keli Solomon’s eighth-grade class. She was also awarded first place at the district level and competed with other districts winners, where she was awarded second place at the VFW Department level at an awards dinner at the Sheraton Hotel in Rocky Hill.